Okay, Canada, here we are. 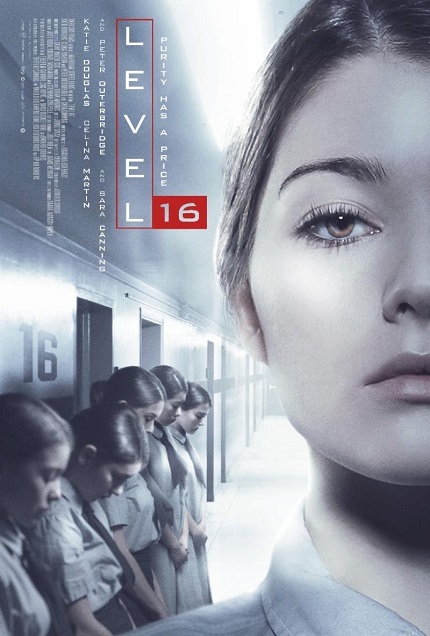 So far, here are the Canadian, March release dates and cinemas playing Danishka Esterhazy's Canadian genre film, the dystopian thriller Level 16. It is your patriotic duty to support Level 16. This Canadian genre film. This Canadian genre film directed by a woman. This visit to the cinema should come as natural to you as sitting down to watch the World Juniors every Christmas. As natural as putting authentic maple syrup on your pancakes. As natural as walking into a Tims and ordering a double double. Your citizenship does not depend on you going to support a Canadian genre film made by a female director. But, if we had our way, we would make it so. The walled-in world of 16-year-old Vivien is and always has been the Vestalis boarding school, supposedly a refuge from an outside world rendered toxic. It’s a neglected, antiseptic institution where girls without families are monitored, their day scheduled practically to the minute, and “education” consists of a constantly repeated list of “feminine virtues” – obedience, cleanliness, patience and humility – preached by a matriarch and propagandized in moral-hygiene films. “I love genre, so that’s what I wrote,” Esterhazy says. “And I found myself in rooms where people told me: ‘There’s no market for this film. Women don’t like genre.’ While I’m sitting right across from them, a lifelong genre fan!"